The Landscapes Portal is growing rapidly. Into our fourth month, the Landscapes Portal has around five hundred unique data sets with complete meta-data and more than two hundred registered users that are uploading and sharing spatial data and maps. We saw a lot of interest in the last two months with more than four thousand unique visitors from across the world (see above map). Our data sets include categories like boundaries, environment, climate etc. The below map shows the extents of all the data sets in the Landscape Portal. To view the full map, click here. The Extent map is filterable e.g. if you wan to see extents only related to category 'environment', press 'Layer Properties' button and choose 'Display' tab. 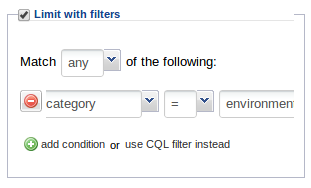 On Display tab, click 'Limit with filters' option and choose 'category' as filtering attribute, equal (=) sign as operator and the keyword 'environment' in the last test box (see below). You can rate layers/maps and provide comments. Please, let us know what do u think.